SORSOGON CITY--The two-hectare cacao nursery recently established via Public-Private Partnership (PPP) in an outskirt village here is now in the process of producing one million seedlings that would jump-start the massive production of the high-value crop in the province. “Our cacao seedling stocks are now in their ‘lollipop stage.’ We are using in our propagation root stock and graft scions supplied by Kennemer Foods International (KFI) under a partnership deal with the COOP NATCCO Partylist and the South Luzon Federation of Cooperatives (SLFC),” Vladimir Frivaldo, the project supervisor, on Tuesday said here. KFI is a foreign-invested agri-business with corporate and contract-farming operations throughout the Philippines and whose specialization is the trade and export of cocoa while SLFC is the umbrella organization of all rural-based cooperatives in Bicol and the Southern Tagalog regions. The nursery, established on a leased property in Barangay Macabog and considered the biggest in Bicol with an initial capacity of one million seedlings, is an initiative under the Cacao Contract Growing Program for the province which Rep. Anthony Bravo, the partylist’s representative, has arranged with KFI, according to Frivaldo. The seedlings will be used in the contract-growing operation wherein participating farmers and cooperatives will be provided with planting materials, technology, training and a guaranteed buy-back of harvest linked to world prices. The program is also implemented in partnership with the regional offices for Bicol of the Department of Agriculture (DA) and Philippine Coconut Authority which will provide technologies in cacao intercropping with coconut and pili. DA’s Regional Integrated Agricultural Research System Training Center, on the other hand, will equip farmer-cooperators with new technologies on cacao growing and processing through training. Such training falls under DA’s application of Republic Act 7900 or the High-Value Crops Development Act of 1995, which allots funds for providing assistance for production, marketing and processing of cacao and other high-value crops to steer farmers towards generating more income. In DA's High-Value Commercial Crops Program (HVCDP) formulated and now ongoing implementation in line with this Act, assistance to producers concerning crop insurance, credit, post-harvest facilities, good seeds and planting materials and fiscal incentives are also provided. Under the contract-growing scheme, farmers are guaranteed additional income estimated at Php 60,000 per hectare by producing quality-grade fermented dry cacao beans from about 500 trees per hectare. Frivaldo said the program is seen to revitalize the cacao industry of the country, with Sorsogon and Bicol playing a vital role, given the region’s climatic appropriateness for the same crop. 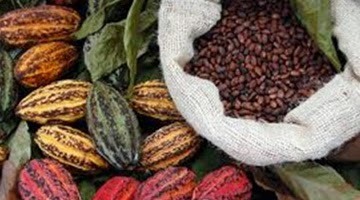 The DA said Bicol’s climatic conditions and soil characteristics support cocoa growing. The agency is taking advantage of this in increasing interest in production among local farmers by way of training them on latest technology and informing them on the local and international demands for cocoa products whose world prices have been constantly favorable. The tropical weather and volcanic soil in the region are suitable for cacao farming but, unfortunately, this important high-value commercial crop has not been given due importance by Bicolano farmers in the past, thus, the COOP NATCCO initiative, Frivaldo said. Through this initiative, he said, cacao will come as another sunshine industry of the region -- next to abaca, coconut and pili. The promise of this high-value crop now occupies the interest of Bicolano farmers and farm owners owing to an intensive campaign of COOP NATCCO and DA to promote its benefits both in terms of economic and health gains. So far, Frivaldo said, agencies involved in this undertaking have already been able to develop warm acceptance of the smallholder cacao-production approach among farmers who have renewed their interest and willingness to collaborate for the promotion of sustainable cacao production. Apart from these, he said, the DA is identifying more suitable areas in Bicol for cacao production, and maximizing the presence of markets that can be organized into workable production-market system.